Congratulations Pat Bettencourt, the 2016 Honorary Mayor of Middleborough! 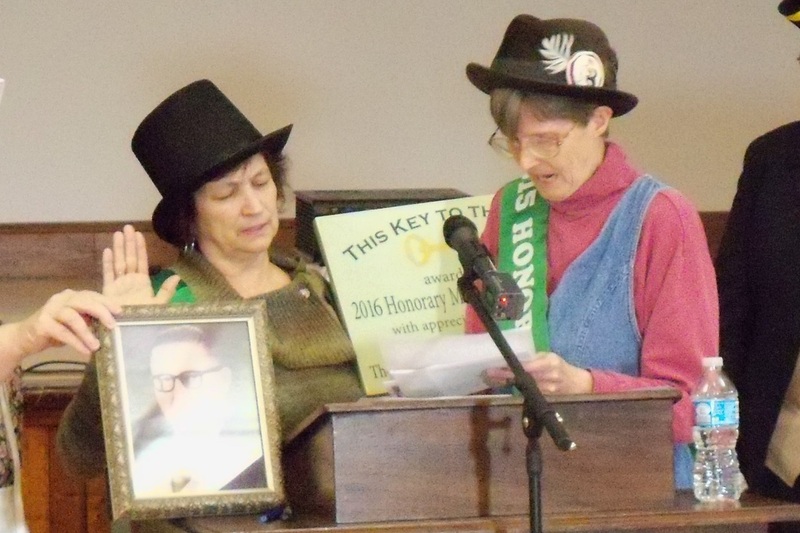 Here is Pat being sworn is by Barbara Chadwick, the 2015 Honorary Mayor. The Inauguration was held on Wednesday, April 6, 2016 in the Ballroom of the Middleborough Town Hall. Pat chose Henry B. Burkland to be her Honorary Deputy Mayor. Learn more about both of them on this page. The "Honorary Mayor of Middleborough" is our election-style fundraising contest. Each dollar raised is a vote. The person who raises the most money earns the title. We aim to simulate, as close as possible, a real election. Candidates must select a Deputy Mayor running-mate. Nomination papers must be filed. The "campaign season" runs through late March. The winner will be announced at an Inauguration Ceremony held in early April. They will hold the title for one year, until their successor in Inaugurated. Honorary Mayor candidates do not have to be residents of Middleborough, and can be any age. Deputy Mayor candidates must be a deceased person from Middleborough's past, and they do not have to be buried within Middleborough. Signers of the Nomination Papers do not have to be residents of Middleborough and they do not need to submit a fee (we do hope they will "vote" for you!). Voters can be individuals or organizations. For 2016, Inauguration Day is Wednesday, April 6th.